Here you’ll find a summary of the most important rules for correctly layouting your print files to make sure that your printing products will be produced the way you want them. Unless otherwise indicated in a product description, we print with the standard four-colour mode. (CMYK). Here you´ll also find brief explanations of the two printing processes we use (offset and digital). This section contains brief explanations of various finishing operations such as folding, binding, die cutting, drilling, grommets, perforation, lamination, and binding. Click here for downloadable templates as aids for correctly layouting your print files. You may also download relevant templates when placing orders in our shop. We print DIN formats by default. Click here for the dimensions of all of the formats of the DIN A,B and C series. To help you select the right paper for your print product, here you´ll find brief descriptions of the types and grades we offer. If you´d like to directly experience their look & feel, we´ll be happy to send you a set of samples. 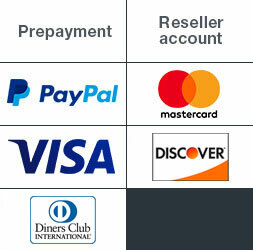 You will find an overview of our payment methods here. For your planning please notice that we can start production not before receipt of payment. It´s very easy to redeem our vouchers. Simply follow these instructions. Our policy for every first-time customer of PrintCarrier.com is : 100%-satisfied or 100% of your money back!